Vector Construction is the proud distributor of the ASLAN Fiber Reinforced Polymer (FRP) product line as manufactured by Hughes Brothers, Inc. in Canada and North Central US. The Aslan FRP products are known worldwide for their high and consistent mechanical and physical properties. FRP’s are accepted worldwide as an alternative to conventional concrete steel reinforcing. 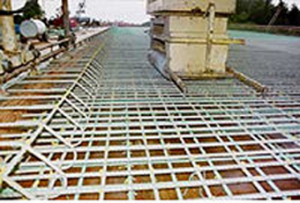 Unlike steel rebars the FRP rebars will not corrode or interfere with electromagnetic environments. Vector Construction also has the expertise for strengthening existing structures using externally bonded or near surface mounted carbon fiber FRP’s. This has become a very popular application which has been used for decades and accepted by structural engineers worldwide. FRP materials are made of various materials such as glass fiber, aramid, and carbon fiber. Vector Construction is involved in the sales of glass fiber and carbon fiber FRP products to clients throughout North America, including Canada and the U.S.